Today (Monday) marks our last full week here in Peru. So of course, the best way to make the most of our time here is to spend hours trekking nearly 9 miles, thousands of feet above sea level. We were outside our hostel at 5:00 in the morning waiting for the tour bus to pick us up. Mind you, when you’re roughly 9,400 feet above sea level in the mountains during wintertime, it’s pretty cold in the morning. The bus arrived at 6:04am (not that I was staring at my watch for over an hour…), but we did stop for breakfast along the way, which definitely helped. After breakfast, we continued driving further into the Cordillera Blancas in El Parque Nacional Huascarán, where the bus would drop us off to begin our trek. As cameras and phones started snapping pictures on the bus during the drive, we stopped at Lake Chinancocha first for some pictures—every tourist’s dream. Before beginning our journey (at around 9:15), our tour guide informed us that most people are able to make it to Laguna 69 in three hours, and some people even make it in two. The tour guide mentioned that he would walk behind the group, so as to help us keep a steady pace. He then informed us that if we were not at the Laguna by 1:00pm, we would need to turn around and return to the bus, because the bus would be leaving at 3:30pm with or without us. Considering the fact that there is nothing around the Laguna or throughout the trek, someone left behind would essentially have to wait to catch a ride back with another tour group (likely the following day). And since you’re thousands of feet above sea level in mountainous areas close to glaciers in winter-time, the weather is just as cold as you might expect. So you know, Laguna 69 (located at the base of a glacier called Pisco Peak) is nearly 15,000 feet above sea level, which is higher than anywhere else in the continental United States. This elevation is merely 2,000 feet below Base Camp on Mount Everest (practicalwonderlust.com). 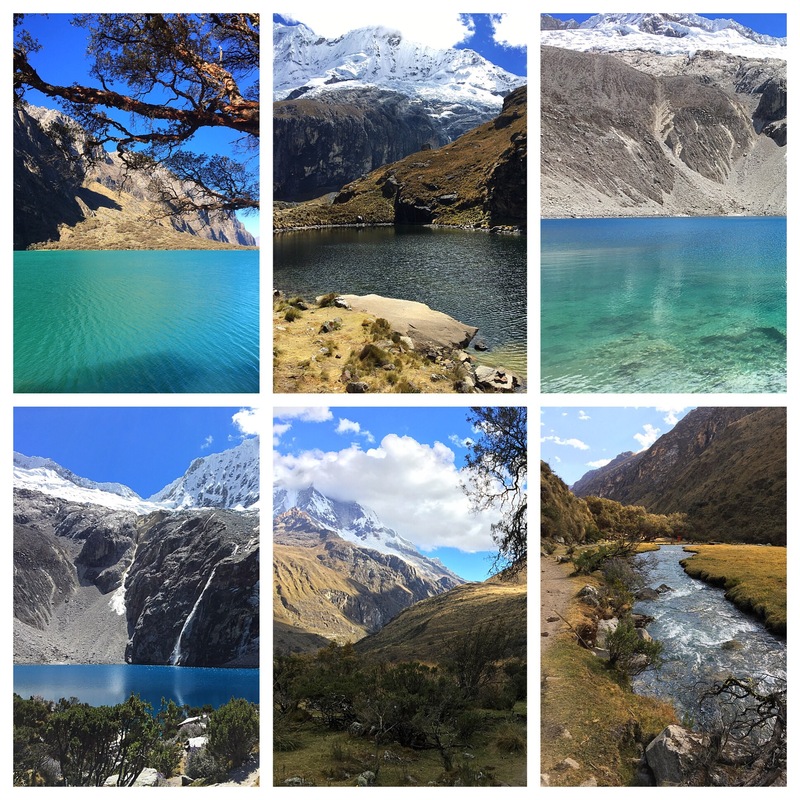 Huaraz is known for its incredible hiking and trekking, and Laguna 69 doesn’t disappoint the countless amount of backpackers and tourists who stop by to give it a shot. We began the trek through a valley (bottom right photo), which was fairly easy (aside from not being able to breathe). After making it through the valley, we came across steeper zigzags of mountainous terrain that was somewhat difficult to navigate. In realtime, I would absolutely say that it was extremely difficult to navigate. However, since it only got increasingly difficult, I have to save the use of any word synonymous with difficult, hard, impossible, scary, out of breath, can’t breathe, please save me, and/or send help. After making it through the first half of the trek (mind you, I’m tying fast. This is now two hours later), we came across a small glacier lake (second photo on top) that was pretty stunning too. By this point, it truly was difficult to breathe (even though this kicked in minutes after beginning our trek) since the altitude was only getting higher as we progressed. After trekking through zigzags and mountainous terrain for what seemed like forever, we finally arrived to an area of flat terrain. When you can’t breathe and everything hurts, it’s the little things in life like flat terrain that would really put a smile on your face. But again, when you can’t breathe and everything hurts, you smile internally. We walked through the flat terrain and came across another mountain that had to be climbed. I read in a blog post that the last part of the trek involved walking over rocks that make you feel as though you’re about to twist your ankle, and constant thoughts that you’re better off quitting and not continuing. As we began walking up the pathway of rocks, I thought this was it. The thoughts of quitting were popping up (even though they were there for more than two hours now), and I had the number of a local podiatrist ready to call at any given moment. People around me were saying that this must be the last mountain before making it to the Laguna. Excitement and anticipation were building, as was my tolerance for pain. We were so close. As we made it to the top of the mountain, I was so excited to see the beautiful Laguna that everyone had been talking about. But of course, nothing in life is that simple. As we crossed over the top of the mountain, we saw another mountain across from us, waiting to be climbed. We made our way downhill, ready to do it all over again. The rocky path was even harder to navigate on the second mountain, and the feeling of wanting to give up was definitely real. We had to stop every few minutes due to the altitude, which had become quite the obstacle (that’s me sugarcoating it). As we continued to hike up the path, we saw people walking down telling us “Casi están allí. You’re almost there.” Those walking around us were also out of breath taking numerous breaks along the way. But we finally made it. And when we did, the view of Laguna 69 in the distance almost made me want to run towards it. Keyword: Almost. While I wish I could say it more gracefully, the truth is, I schlepped over to the Laguna and laid down alongside the most beautiful view I had ever seen. The tranquil turquoise-blue water below the most narrow waterfall, carrying clear glacier water into the Laguna was absolutely breathtaking. It was truly a shame that the trek took my breath away first. Seeing so many people accomplish the goal of trekking 7 kilometers (roughly 4.5 miles) towards Laguna 69, 15,000 feet above sea level was truly incredible, and it felt rewarding to be able to reap the benefit of seeing such a spectacular site. We arrived at 12:52pm, so fortunately, we got to stay a while and enjoy the Laguna, without having to turn around and return to the bus beforehand. Some people jumped into the glacial water and swam, but I was perfectly content putting my hand in and leaving it at that. After enjoying about 30-45 minutes by the Laguna, our tour guide mentioned that it was time to return. I had completely forgotten that we had to make our way back and walk another 4.5 miles without an oxygen tank. I’ll spare you the details of our hike back, but will say that the views were incredible, and that I laid in the middle of the parking lot upon our return, thankful for the experience, and thankful for the opportunity to not have to walk anywhere else for the rest of the day. Throughout the trek, I was fortunate to walk alongside one of the students from our program who continuously pushed us to keep going. Just like anything in life, having a support system—whether it be friends, family, or even an internal support system—is truly important, because at our seemingly lowest moments when we want to give up, oftentimes we need a push to get back up and continue where we left off. Fortunately for me, I had that on this trek, and was able to enjoy incredibly beautiful sites along the way. Find and/or create your own support system, and don’t be afraid to utilize it. It will come in good use when you least expect it. After an incredible day of sightseeing, there was still one more task on our to-do list— Font màgica de Montjuïc, also known as the Montjuïc Magic Fountain. The fountain first premiered in 1929 for the International Exhibition (also known as the World’s Fair), and has since blown tourists and locals away with its beautiful display of colors, lights, and of course, its synced and coordinated water movements. The fountain’s water moves in accordance with the music that is playing, and the lights that are constantly changing, and it is truly a wonderful sight. Behind the fascinating water show is the Museu Nacional d’Art de Catalunya, which is Barcelona’s National Art Museum. Although we didn’t have time to see the exhibits, we were able to see the museum lit up at night, which was also spectacular. Once the show ended, my sister and I crossed the street and came across Las Arenas, which is a shopping mall. We didn’t know this at the time, as we assumed it was a bullfighting ring since that’s what it looked like. It turns out, Las Arenas was actually a bullring, but was transformed into a mall in 2011 since bullfighting in Barcelona was banned in 2010. Although the shops in the mall were closed at the time, we went to the rooftop to see what was up there, and ended up sitting down at a restaurant for dinner. We ordered sangria (which if you couldn’t tell by now, is a must in Spain), as well as patatas bravas (once again), and seafood paella (because we couldn’t get enough of it. The food and views from the rooftop were great, and we couldn’t wait to get started on our next day in Barcelona!